You love spending time on the river, and we’ve seen you bouncing to those reggae jams – so you’ve got no excuse NOT to take part in next month’s inaugural Reggae On the River event! Check this: Reggae on the River is not only a day of community fun at Caras Park (read food, beer, reggae and floating), but your participation will go a long way to support the Cash Hyde Foundation and Brennon’s Wave – as well as keeping the mighty Clark Fork clean! Here’s the breakdown: Starting at noon on Aug. 2, Zoo Town Surfers will be shuttling people up the river all day long while Strongwater Surf Shop demonstrates their awesome river boards on Brennan’s Wave. Meanwhile, imbibe in some awesome activities for kids, the aforementioned food and beer and take in some good fellowship in the sun! 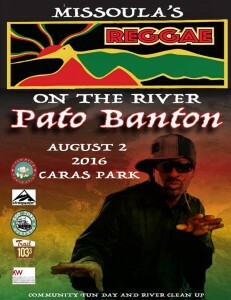 And anyone who collects a bag of trash from along the riverbanks will gain free admission to see Pato Banton perform in the park later that night! So grab your swimsuit, sunscreen and all your friends and help make the first ever Reggae on the River a blast! Tickets are $5 and are on sale now at Rockin’ Rudy’s, Ear Candy Music and Strongwater. The Cash Hyde Foundation promotes pediatric cancer awareness and assists families fighting cancer “with smiles” through projects such as donating customized “Little Tikes” cars to children’s hospital across the United States.